Toronto Plastic Surgeon Dr. Wayne Carman specializes in cosmetic plastic surgical procedures with surgery of the breast being of special interest. Dr Carmans practice at the Cosmetic Surgery Institute has emphasized breast augmentation surgery for many years. He believes that his approach to planning and execution delivers the best results for a wide range of individual patient needs. Breast augmentation using an underarm incision (transaxillary approach) has been a uniquely successful aspect of his breast surgery practice. Dr. Carman has performed over 1200 transaxillary breast augmentation procedures and is acknowledged by his peers as having the most experience in this technique of any surgeon in Canada. 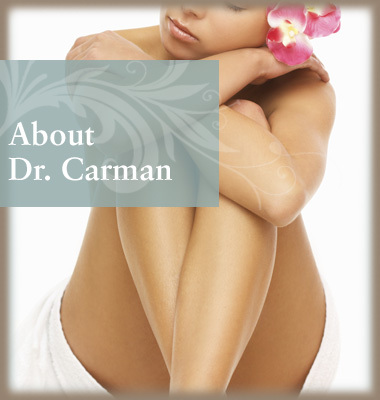 Dr. Carman is the Director and founder of the Cosmetic Surgery Institute in Toronto, an exclusive private surgical facility in midtown Toronto. The clinic has been custom designed for the comfort, privacy and safety of cosmetic plastic surgery patients. Full certification by the Canadian Association for the Accreditation of Ambulatory Care Facilities (CAAACF) ensures the highest standard of care and allows Dr. Carman to perform surgery under either local or general anesthetic on a day stay or overnight basis. Patient comfort and safety always has the highest priority. The Cosmetic Surgery Institute is unique in that breast augmentation patients are always kept overnight with a private nurse. Simply stated, patients heal faster and with less pain if the immediate postoperative period is managed professionally. A member of the Royal College of Surgeons of Canada in Plastic Surgery, Dr. Carman has been in private clinical practice for over 20 years and is the past Director of the Scarborough General Hospital Burn Unit. He is a member of The Canadian Society of Plastic Surgeons, The Canadian Society of Aesthetic Plastic Surgery, The American Society of Plastic Surgeons and the Scarborough Hospital Surgical Society. Dr Carman's extensive experience in reconstructive and cosmetic plastic surgery enables him to offer his patients a full range of facial and body contouring procedures.